Julie's Stamping Spot -- Stampin' Up! 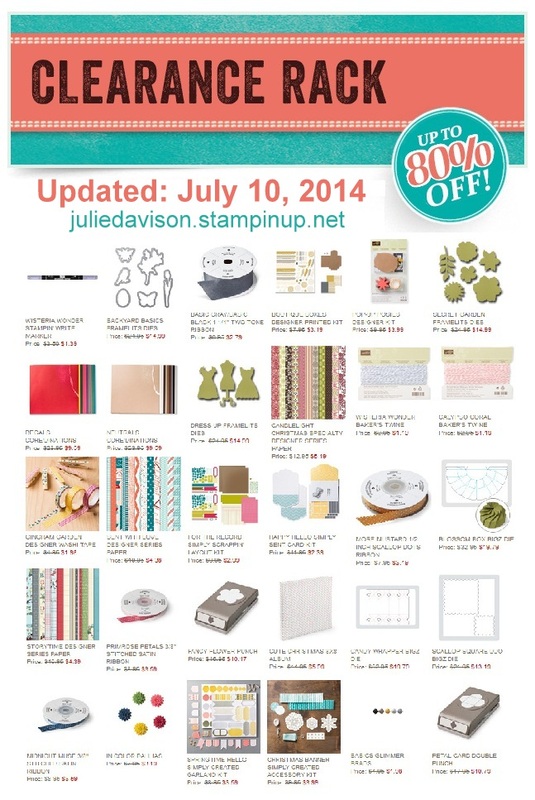 Project Ideas by Julie Davison: 7-10-14 Clearance Rack UPDATED! Stampin' Up! updated the Clearance Rack section of my Online Store with a new selection of retired designer paper, punches, ribbon, embellishments, kits, and more! Shop early for the best selection! Don't forget to check out the Weekly Deals and other new arrivals. Learn More. Combine the Clearance Rack items with your favorite picks from the new catalog on one order. If you order $40 or more, you'll get a free make and take kit from me at the end of the month! Use Hostess Code: when you check out.